Low or easy maintenance gardening is what many people would like to embrace, either through necessity or preference. No garden will be zero maintenance but most gardening activities have a lower input solution or alternative to consider. All too often the most common answer to the problem of finding time, ability or enthusiasm to maintain a garden, is to pave the whole thing over. Thankfully, with some simple considerations, there are much better ways to manage a garden without becoming slave to it. Although this might rule out more time-consuming pursuits such as clipping topiary sculptures or manicuring fine lawns, it does not mean a low maintenance garden need be bland or uninspired. It just means giving a little thought to some of the jobs we perhaps have always done or eliminating tasks through better design and planning. Start by looking at how much input you can make to the garden and the features or functions that are most important to you. Not everything need be lost. For example, if growing your own vegetables is high on the priority list, keep a veg patch that will meet your needs while minimising activity elsewhere such as replacing lawn with paving or a rose garden with a shrub border. 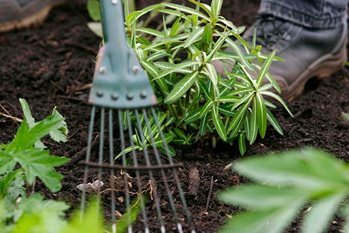 Also try to position features that are more labour intensive closer to the house or the shed so you’re not wasting a lot of effort walking, carrying or barrowing items up and down the garden. Consider installing a water point close to where you are most likely to need it (e.g. a greenhouse). Equally, it may be that an automatic irrigation system, especially for lots of pots and planters, could take a lot of stress out of watering. Some design decisions will not be so obvious. A living hedge may require clipping every year but if kept to a manageable height this might in the long run be less onerous than having to paint and replace wooden fencing. There is no such thing as a ‘no maintenance’ plant but many hardy evergreens, once established, will require little care. Ensure you check the expected mature height and spread, otherwise pruning may be necessary if the space is too small for the plant. Let the grass grow long. Consider keeping a small area of short grass in the most formal area of garden but reduce the amount of cutting in other areas. Experiment with different frequencies of cut; some parts may be acceptable with being mown just once a fortnight, while some ‘wilder’ areas could be left unmown between March and September. Introduce a sense of purpose to long grass by mowing a path through the centre or a strip at the edge. You can even add interest by introducing wildflower plug plants into the sward. Stop collecting the clippings. By allowing the clippings to drop back onto the grass, less time and effort is needed to empty the box. The lawn will also need feeding less as some of the nutrients will return in the fallen grass. To reduce problems with unsightly strips of brown, dead grass sitting on the surface of the lawn, mow as regularly as possible. It may be worth investing in a ‘recycling’ or 'mulching' mower which is designed to chop the clippings before returning them to the lawn. Replace fine turf with a harder-wearing seed or turf mix. Fine or high quality turf will required more input in the form of aerating, scarifying, feeding and mowing than more durable lawn mixes. Look for seed or turf that is described as ‘amenity’, ‘multi-purpose’, ‘hard wearing’ or simply ‘low maintenance’. Some mixes include micro clovers to help reduce the need to water and feed. Be more relaxed. Relax weeding, feeding and moss control – such a lawn will be more of a visual patchwork but will often stay greener for longer when stressed by drought or waterlogging and is perfectly acceptable for many gardeners. It is also more likely to support a greater variety of wildlife. Install permanent edging solutions. This will reduce the need for hand edging. There are many styles and materials to choose from including Everedge, Rite Edge and Smart Edge. Or at the very least look for edging shears that incorporate a collection box. Consider using a professional lawn maintenance company. If budget allows, getting in the professionals to keep on top of your lawn can take a weight off your mind and even free you up to get on with those other ‘nicer’ gardening jobs. Artificial turf. Something of a taboo subject for many gardeners but artificial turf has a role to play. Modern artificial turf can be reasonably realistic and there is usually a choice of styles on offer. Remove small fiddly, narrow areas, to cut down on edging and reduce time and effort spent manoeuvring mowers. Use a mower with a wider cut and more capable power unit, or even consider 'Robot Mowers', that mow unattended. There is, however, no getting around the fact that lawns are one of the most intensive features in a garden so there may be no choice but to replace with an alternative. This might mean turning the area over to gravel, paving, decking or bark. Much routine work in the garden involves weed control in borders and the maintenance of herbaceous perennials (e.g. staking, cutting back, lifting and dividing). It makes sense, therefore, to replace some or all perennial beds with shrubs. Shrubs are easy to plant through a weed-suppressing membrane. Overlay this with an attractive mulch such as bark or gravel and it may be several seasons before weeding or topping up of the mulch is required. Weed seedlings are unlikely to get a hold in the mulching material but if they do can be easily hoed off. Once established, these beds are also unlikely to require regular watering. And if you are concerned that shrubs may limit your choice, think again as there are many interesting shrubs to choose from. Reduce the need for pumps and filters by not introducing fish into the pond. Fish-free ponds or wildlife ponds often settle into a good natural balance, and suffer from blanket weed and algae problems less frequently too. Don’t be afraid of natural succession. Rather than the arduous task of removing silt from the bottom of a pond every few years, consider allowing your pond to fill in. Or deliberately convert a pond into a bog garden to reduce tasks such as removing leaves, cleaning out, planting or pulling out blanket weed. Avoid very shallow water features that quickly dry out and need topping up. On soils that naturally have a good soil structure, the ‘no dig’ approach can be very effective. This method minimises cultivation of the soil through the use of organic weed-suppressing mulches (e.g. bark, garden compost, municipal compost, rotted manure or even, when better alternatives are lacking, cardboard overlaid with grass-clippings) and avoidance of compacting the soil through walking on it unnecessarily. Bedding plants and temporary plantings. Traditional bedding schemes can offer great colour but are very seasonal and can take a lot of work, especially if you are growing your plants from seed or having to grow on plug plants in a greenhouse before planting out. Moving away from bedding to borders with permanent plantings would help eliminate this dependency. Similarly, if you’ve had success with wildflower annuals, for example, why not consider sowing a perennial meadow instead to avoid annual sowing?